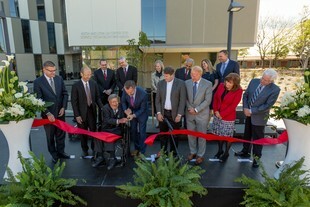 LA MIRADA, CALIF. — On Feb. 16, 2018, Biola University dedicated the university’s most ambitious building project to date — the new $63 million Alton and Lydia Lim Center for Science, Technology and Health. By 2022, employment in careers related to science, technology, engineering and mathematics is projected to grow to more than 9 million, according to data from the U.S. bureau of labor statistics. With cutting-edge resources and technology, the Lim Center will bolster an enhanced, industry-leading learning environment. “Over the past few years as we've anticipated the completion of this building, what we've had in mind as leaders is to take Biola University to a new level in preparing students for professions in the sciences, attracting students who are extraordinarily capable, and providing them an education deeply rooted in biblical thinking, moral grounding, and ethical decisions so that they can become leaders in the greater sciences — professional and research and teaching,” said Biola University President Barry H. Corey. The expansive new science facility, which was completely funded by donors, will serve as a home to some of the university’s fastest-growing and most in-demand programs such as biochemistry, biological science, communication sciences and disorders, and engineering physics. The Alton and Lydia Lim Center for Science, Technology and Health will triple the amount of space devoted to science education at Biola. “The remarkable, new and expansive Alton and Lydia Lim Center for Science, Technology and Health provides Biola students outstanding opportunities for study in cutting-edge facilities with highly talented professors who are Christ-centered and student-focused,” said Paul Ferguson, dean of Biola’s School of Science, Technology and Health. Standing tall on the southwest side of University Drive, the 91,200 square-foot center features 27 laboratories, six classrooms, a human anatomy suite, greenhouse space for the botany program, a dedicated SEM (scanning and electron microscope) lab and TEM (transmission electron microscope) lab, and state-of-the-art technology. The Lim Center represents the beginning of an exciting new era for science education at Biola. Students majoring in the science or health-related fields can expect not only academic rigor, but academic rigor set in the engaging, high-tech setting the Lim Center offers. Biola graduates advance to top medical school and graduate programs across the country, such as UCLA, USC, Dartmouth, University of Chicago, Georgetown, Yale, Harvard and MIT. In addition, Biola graduates demonstrate excellence in their careers post-graduation and work in many prestigious organizations such as City of Hope, Children’s Hospital of Orange County, Apple, Amazon and NASA. Learn more about the Alton and Lydia Lim Center for Science, Technology and Health online. Learn more about Biola’s majors and how to apply online. For more information, contact Jenna Loumagne, media relations manager, at media.relations@biola.edu.